Even though you may be surrounded by some friends who support your efforts, you may feel that the important things you have to say go unnoticed or unappreciated. Consider a quiet rebellion. You need a good release for your frustrations, so get moving! At least join the office softball team or something similar. Worry can drain your vitality, so redirect your mental energy toward positive thinking. Friends are a great source of support, and if you're stuck on some emotional issues, may provide your most effective level of objectivity during the Moon on the 7th. It's easy to jump to conclusions from the 7th—21st, when you may respond emotionally rather than rationally to a problem. But you're needing a change of pace, and may feel tired of all the game-playing. Find ways to address your deeper issues and needs, and watch excessive expectations. 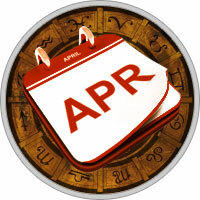 The wheels of progress may seem to move too slowly, especially once Mercury enters its retrograde cycle on the 14th. You have some great ideas, but they can be shot down by ultraconservatives who seem to be afraid of progress. Listen to their concerns, and find ways to fit your innovations into the existing system —change from within. Do pay attention to undermining or jealousy behind the scenes near the Moon on the 22nd. Ignoring it won't make it go away. Sound advice from a respected colleague or counselor can give you the foothold you need to stay steadily on course mid-month. But watch out for red herrings!